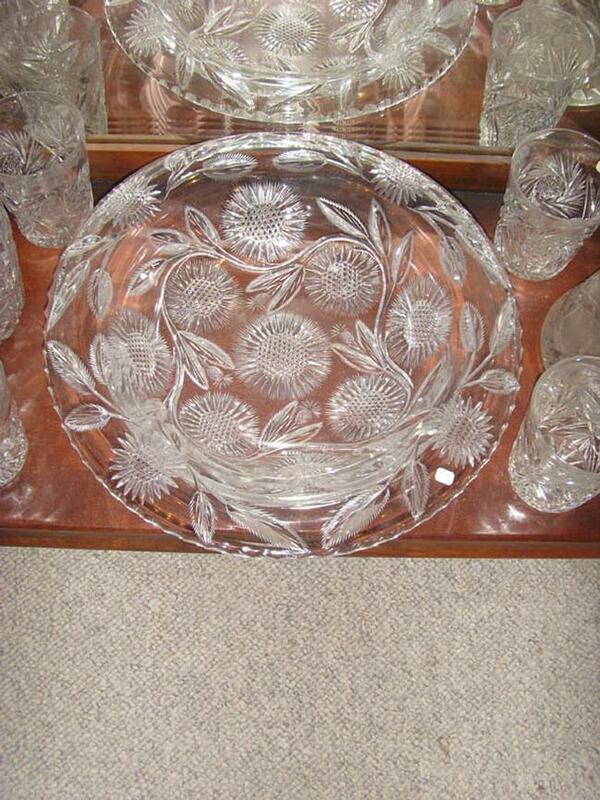 Large American Cut Glass Bowl with Flowers -- This exquisite bowl measures 13" in diameter and has a curved lip. It is 3" tall, decorated with what appear to be large sunflowers, but I'm not sure above what the flower actually is. I can't find a signature on it which I find quite unusual as it is of the best quality. There are no damages of any kind on it. This exquisite bowl measures 13" in diameter and has a curved lip. It is 3" tall, decorated with what appear to be large sunflowers, but I'm not sure above what the flower actually is. I can't find a signature on it which I find quite unusual as it is of the best quality. There are no damages of any kind on it.